Who stole the Crown Jewels? Meet Keira, a girl with a vivid imagination, bright red hair, very cool glasses, crazy perception skills, and a shy demeanor; her mischievous puppy, Waffles, with a nose that can sniff trouble anywhere; and Papa, her grandfather, a retired secret agent who is itching to find something to do. Together, they created the Keira and Papa Detective Agency for solving mysteries that have little to no real clues. Scotland Yard and the Queen of England urgently need the agency's help to find the mysteriously missing Crown Jewels. Will they be able to find them in time? Meet the girl who became a secret agent.... Not even her parents know! Join forces with Keira, Papa, and Waffles on a thrilling ride of suspense, surprise, and fun solving The Case of the Missing Crown Jewels. Fun Mystery for kids of all ages. A wonderful mystery adventure for old and young in a short format that will hold the interest of all listeners. The Narrator makes the magic come alive so everyone can enjoy the adventure. I enjoyed the Case of the Missing Crown Jewels. The narration was great, it sounded like a full cast production! Keira, 8 years old, discovers a hat floating in the water. When she puts it on, she suddenly acquires great knowledge. Her retired grandfather used to be a spy. He has been bored with retirement and he and his granddaughter form The Keira and Papa Detective Agency for solving mysteries. They are summoned to England because the crown jewels have been stolen. I think kids will enjoy this book! Besides the fun mystery, the story gives a little history of England and British culture in a way that kids will hardly be aware that they are learning. I also enjoyed that the authors, in a subtle way, gave a lesson on how to deal with frustration in a healthy way. 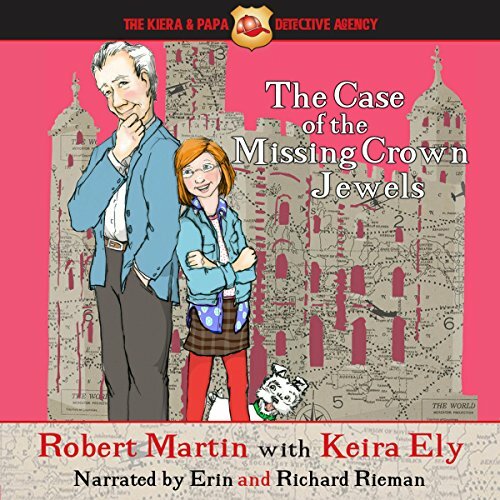 The Case of the Missing Crown Jewels by Robert Martin and Keira Ely, narrated by Erin Rieman and Richard Rieman is a wonderful audiobook for kids in upper elementary through middle-school, as well as families looking to have some fun and spend quality time together! It is thought-provoking and has the potential to produce meaningful discussions, both in and out of the classroom. The book starts off with the list of characters, complete with descriptions. I found this to be very useful because it is a mystery, and the last thing we want to do is place blame on the wrong person. C'mon, we are professionals, after all! :-) 8yo Keira and her grandfather, Papa, are a great team! This dynamic duo are not only best friends, but they are also partners-in-crime, literally. After finding a magic hat and discovering its special powers, The Keira and Papa Dectitive Agency is formed. Their first case is one of high-standing...they are hired by the Queen of England to find out who stole the Crown Jewels. Along the way, readers/listeners are given so many opportunities for learning; the story is filled with interesting facts and exciting details that keep us engaged and focused on the task at hand. Because we travel from country to country, we are also introduced to the language and culture of those areas. Our new friends, along with Emma (Keira's doll) and Waffles (Keira's dog), help us along our journey in finding out whodunit. However, it doesn't come without a couple twists and turns, so make sure you pay attention! The performances of Erin Rieman and Richard Rieman were outstanding! They both do an excellent job in playing a variety of characters of various ages. The inflection, volume, and pace of each character was right on, making this audiobook very enjoyable and easy to follow. I feel my overall experience was heightened because I chose to listen to the story, rather than read it. Because of their clear and correct pronunciation, I was able to visualize what was going on and felt like I was there next to them as they solved the case! At just over 2 hours, they are the perfect team! Their consistency throughout the entire book and age-appropriate voices kept me listening from start to finish, without the need for a break. This is my first time listening to them, and based on this performance alone, I can say with confidence, there will be more! The Case of the Missing Crown Jewels by Robert Martin and Keira Ely, narrated by Erin Rieman and Richard Rieman is a story about trust, teamwork, love, friendship, and family, with a special focus on the bond between grandchildren and grandparents. Without hesitation, I rate this 5/5 stars across the board. I thoroughly enjoyed it, and I am confident you will feel the same. I recommend this audiobook to teachers looking to supplement their lessons when teaching about plot, characterization, and specific literary and fictional elements. It also could be a fun and creative way to meet CCSS requirements, in terms of finding evidence within a text to support claims. The vocabulary used throughout the story is more advanced, offering a variety of opportunities to use this as a mentor or guide to learning and using new words. I also recommend this audiobook to families looking for a fun, adventurous listen as they spend a Saturday together at home or a car ride up north. Either way, kids and adults will find this fun and entertaining. I definitely hope this is a series that continues...I think many would love to follow these characters on more of their mysterious adventures as they solve cases and find out whodunit! Such a cute story- GREAT for kiddos! Listening would have been improved by seeing the pictures that would accompany it in the book, so I recommend reading as you listen. The story follows Keira, who found a magic cap in the water, and her grandfather on a case to find the Missing Crown Jewels “across the pond.” She brought along her “doll” and puppy who both play valuable roles in solving the mystery. Young listeners will enjoy this shy, but impressive sleuth, who outshines the adults trying to solve the crime. She is a science experimenter – beyond her age. Fun and encouraging to young listeners who might doubt their own abilities. The narrator, Erin Rieman, of our heroine shines in presenting her lines, however the pause before each attribution was distracting and could have been shortened in editing. The male narrator Richard Rieman improved as the story progressed. A good listen. I received a free copy of this audiobook and have willingly provided this honest review. Summary: Keira finds a magic hat that gives her access to knowledge she might not have otherwise. She forms a detective agency with her grandfather (whom she calls Papa). They’re called upon to discover who stole the crown jewels of England. - I heard the audioversion, so some of my spellings might be a tad off. - Narration 4.5/5: Very nice. It’s nice to have the male/female parts largely divided between the two narrators. The mother sounded a tad too formal, but Keira’s voice was excellent as were most of the British characters. - Plot 2.5/5: Nonsensical at best. I get this is a kid’s book, but that doesn’t mean it should lack all sense. The crown jewels get stolen and they turn to a kid with a magic hat for the answers? They seem overly concerned with finding footprints at the crime scene. - World-building 2/5: The magic hat’s powers aren’t really well-defined. Sometimes, it seems all powerful, in which case they should have just asked it “hey, who stole the jewels and how do we catch them?” At other times, it gets broken then repaired with duct tape. Magic in a kid’s story is fine, but there should still be an established system of why it works the way it does. Spy and detective are used pretty much interchangeably here, which is annoying because they’re way different jobs. Keira and her grandfather form a detective agency, but she repeatedly refers to what they do as spying, which simply isn’t true. It’s an investigation. The doll angle is kind of cool. Conclusion: If you’re very good at suspending disbelief and just looking for some mindless kid charm, this is a decent choice. It’s very well-presented, even if the story is somewhat lacking in sense. I like the main character, Keira, a lot. I think girls her age will love her; she's a little shy, she wears glasses and has a dog - quite an average girl, you'd say... But then she finds a magic hat which makes it possible for her to do many unusual things (who wouldn't like to find such a hat...:)) - and that somehow boosts her self-confidence, allowing her intelligence, liveliness and perceptiveness really shine... And she doesn't lose that new quality, even in trouble. The plot and the language the authors use to tell their story are quite simple, but I'd say adequate for the target age group. The events follow quickly, and Keira is the one who propels them, discovering clues, not giving up when the investigation seems to go awry - and kids reading the book can definitely relate to her easily. There is also a little bit of humor in the story with Waffles the dog being the comic relief in a way. The narration is very good, too, with Erin Rieman and Richard Rieman reading the female and male parts respectively. They give each character a very distinctive voice, so kids won't have any problems recognizing who is who, both in the narrative parts and in dialogues.